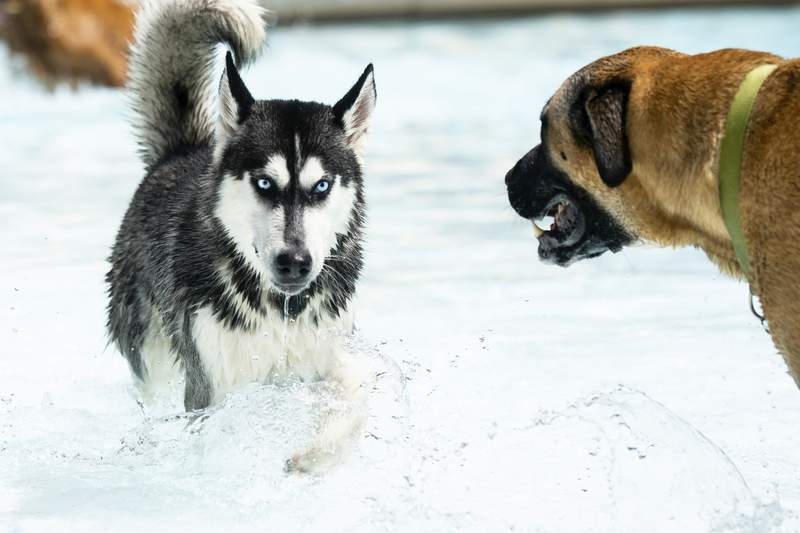 Photos by Brett Luke | The Journal Gazette Sierra, a Siberian husky, makes friends with other dogs at the annual Dippin' Dogs swim at Northside Pool on Sunday afternoon. Erica Brigg's dog Beau jumps through the pool at the Dippin' Dogs swim. Finn, a 2-year-old mini goldendoodle, plunged into Northside Pool without hesitation Sunday, intent on retrieving a toy floating on the surface. He soon returned on deck, waiting for owner Mike Anderson to start the process again. “Catch your breath for a minute,” Anderson said. Like other dogs at the pool, Finn seemingly didn't want to waste the annual opportunity to frolic in a facility normally reserved for humans. 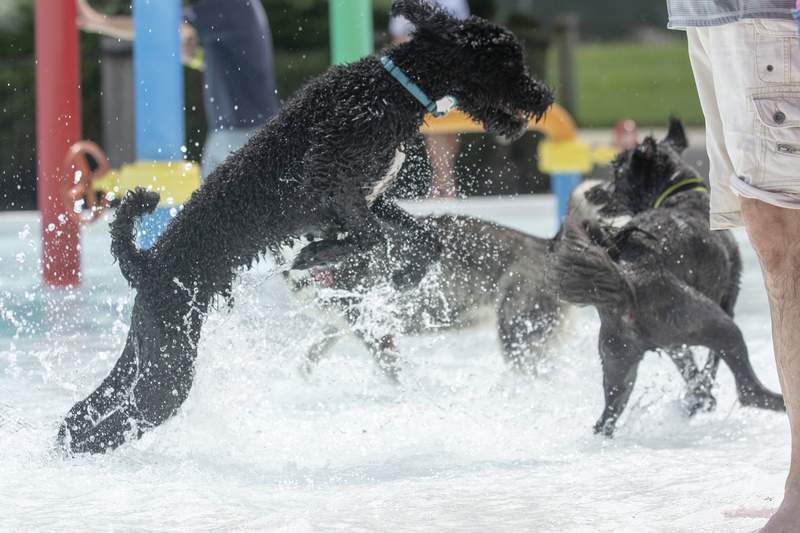 The Fort Wayne Parks & Recreation event – dubbed Dippin' Dogs – is proving to be popular among its targeted audience, dog park permit holders. Staff expected 101 canines across four 45-minute sessions, up from about 80 last year and about 50 in 2016, the inaugural year. Northside Pool closed for the season Saturday. Sarah Panicacci learned of the event through a flyer in the mail. She appreciated the outreach because she recently moved to Fort Wayne from Kalamazoo, Michigan, and owns a puppy who enjoys swimming. “This is great for her,” Panicacci said of Mose, a 9-month-old golden retriever. The pup swam easily in the deep end but needed assistance with climbing a ladder. “She's trying so hard,” Panicacci said, watching. For other dogs, interest in swimming didn't come naturally. Some owners carried their pets to the water, only to have the dogs run away. Kelly Bercaw empathized with one such owner, telling him her goldendoodle didn't immediately embrace the water. Sunday marked the longest Lucy, 2, has swum unassisted, she said. People, meanwhile, could either gather poolside or wade in shallow areas. They agreed Dippin' Dogs offered their pets a good workout. “She'll take a long nap later,” Panicacci said as Mose doggy-paddled after tennis balls.